Madison High School is one of 3 PPS high schools being modernized or rebuilt through the successful May 2017 Bond. Master planning for Madison was completed in June 2016 using funds from the 2012 Bond. Construction will begin in the summer of 2019. 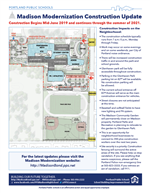 Click here to view a fact sheet about the Madison modernization project. | Español | Tiếng Việt | Русский | Soomaali Learn more about Madison High School here. The Madison Modernization has completed the Design Development phase and the project is within budget and on schedule to open in the fall of 2021. The permitting process has started and the general contractor has hired several key subcontractors to assist with the next design phase. Approximately 60% of the school will be demolished and built as new construction. The goal of the Madison DAG is to develop comprehensive, equitable, integrated and visionary high school campus plans and schematic designs with authentic school community engagement. The DAG will consist of a group of parent, teacher, student, and community stakeholder representatives who will be involved in the development of the design of the modernized Madison High School. The Madison master planning committee (MPC) was a group of school and community stakeholder representatives who worked together to help provide feedback for the Madison master plans. MPC members synthesized community-wide input and shared the evolving details of the project to others in the community. While MPC members did not make decisions, their input was crucial in creating a design that the entire Madison community can be proud of. The committee began work in February of 2016 and completed their work in early 2017. During the master planning process one Public Design Workshop an open house and several community focused meetings took place providing the greater Madison community a voice in the design process. To learn more about the impacts of that construction on the neighborhood and community the Madison design team is hosting an open house on Tuesday, February 19th from 6:00 p.m.–8:00 p.m. in the Madison Library, 2735 NE 82nd Ave. Come meet the Madison design team and general contractor as they provide updates on design features and upcoming construction. Madison High School had its master plan approved by the School Board in late May. Design work continues and construction at Madison will begin in the summer of 2019. View the PULSE story about the Master Plan approval here. To inspect more of the plans, see the 510-page Master plan report here. Madison's proposed modernization will completely reconfigure and update learning spaces with a focus on indoor environmental quality, sustainability and historic preservation. Full modernizations retain the historic character of the school while bringing those buildings up to code and concurrently creating a more modern learning environment. This is considered the most cost-effective, sustainable way to improve Madison, due to age, condition and historic significance. View an info-graphic that describes factors that influence the design of a future Madison High School. Click on the image to view a 360 degree render of the Madison HS redesign. Learn more about Madison High School at their web site or the Madison Facebook page. The Opsis | DAO team is looking forward to transforming Madison High School into a true 21st century learning environment and vibrant center for its thriving diverse, multicultural, and multi-ethnic community.